Lonnie Vickery has been an athlete his entire life. Without formal training, he relied on strength, conditioning and ground & pound to win several amateur Mixed Martial Arts MMA fights. Lonnie knew he had to improve his ground game if he was going to continue to lead the pack. Under the guidance and leadership of Jeremy Fields - 10th Planet Black Belt out of Corona California, Lonnie dedicated the next 3 1/2 years to learn Eddie Bravo's unique style of 10th Planet Jiu Jitsu. Lonnie is now the head moon at 10th New Caney Texas and is dedicated to the success and growth of his students, coaches and the 10th Planet organization. Justin Harper and Lonnie Vickery met in 2nd grade when Justin was being bullied by a student and Lonnie came to his defense. Justin pursued his interest in self defense and developed a passion for teaching. Since 2000, he has been mentoring children and adults. He eagerly shares his knowledge and skill with his students so they may achieve their goals in a safe and supportive environment. Justin graduated from Texas A&M with a degree in Philosophy. He has achieved a Brown Belt under Carlos Machado affiliate Bubba Bush in College Station, Texas and a Purple Belt under Jeremy Fields 10th Planet Corona, California. Justin has over 12 years experience in MMA, Jiu Jitsu and Striking. He is undefeated as an Amateur MMA Fighter. Carlos got involved in Jiu Jitsu (Martial Arts) because he wanted his daughter to be able to defend herself. As a child, Carlos trained Tae Kwan Do, but realized that punching and knocking someone might be more difficult for a girl. He was looking to provide her with a more effective way to deal with threats. He found a local Jiu Jitsu school and started she started training. Two (2) weeks later, he liked it so much, he joined and started training. Within two (2) years he opened a strength and conditioning gym (Monstros); which offered Jiu Jitsu training as well. 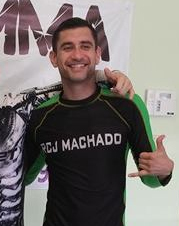 Carlos was researching better techniques to help himself and his students and was drawn to Eddie Bravo's - 10th Planet program. Soon thereafter, he connected with Lonnie Vickery who had the same interests. Both he and Lonnie realized that although punching and kicking may be a nice way to defend yourself - submitting someone with style is priceless. The Monstros location is bilingual school (Se Habla Español). Classes are taught for kids, teens and adults both in Spanish and English. Jeromy's interest in Jiu Jitsu begin during the early days of the UFC. At that time, there were so many styles of fighting and no one really knew which ones were the best to train. What impressed Jeromy was that the TV program helped viewers better understand the unique styles and the competition demonstrated the effectiveness of each art. Jeromy felt that Muy Thai dominated the standup and Jiu Jitsu domained the ground game. For many, Jiu Jitsu was an unknown art at that time. Soon thereafter an MMA fighter pulled off a moved called "The Twister". It was the first time it was ever done on UFC. After the win, Chan Sung Jung, aka "The Korean Zombie" thanked Eddie Bravo for demonstrating his move on an Internet video. Although interested, Jeromy unfortunately didn't have the money or a convenient place to train at that time. Then in happened. He was talking to a girl and an ex-boyfriend threatened him and he was worried. The guy was much bigger than Jeromy and he was concerned about defending himself. Lonnie was his next door neighbor at that time and he knew he had done some MMA, so they started training striking in his front yard. Soon after, a local gym hired Lonnie to teach MMA so they stopped the front yard training and started training at a real gym. Jeromy was one of the smallest guys is the class and was consistently getting smashed by Lonnie and other students so he began researching 10th Planet techniques. He found an Eddie Bravo technique called the "lock down" which helped so control larger opponents. After locking Lonnie the rest is history. Jeromy is thrilled to be officially part of the 10th Planet organization and is driven by his students, their development, improved confidence and success. He knows he is changing the lives of people he trains.